Cloning – Be your own creator! Ever wondered how it would be to be in a position to create a copy of yours? Cloning! Is cloning only the stuff of movies? Or is the science behind it real? Exactly what is cloning and how can it be used in the real world? These are the some of the questions that researchers and scientists all over the world have been attempting to answer for years. The subject of cloning hit the front pages of newspapers all over the world in 1997 when scientists in Great Britain successfully cloned a sheep - Dolly. After that on Jan. 8, 2001, scientists at Advanced Cell Technology, Inc., announced the birth of the first clone of an endangered animal, a baby bull gaur (a large wild ox from India and southeast Asia) named Noah. The baby bull gaur, Noah, was delivered on Monday but died within 48 hours of common dysentery. Researchers from Advanced Cell Technology (ACT) in Massachusetts said the problem was unlikely to be related to the cloning procedure itself [Source BBC News]. This experiment demonstrated and proved that it is possible to save endangered species through cloning! Clones are organisms that are exact genetic copies. 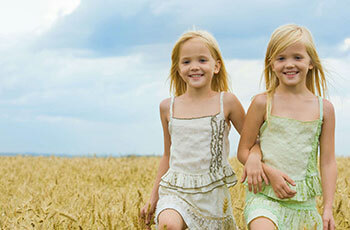 Clones can come into existence naturally like the case of identical twins. This is just one of the many examples of natural clones. Identical twins, despite sharing the same DNA, have unique fingerprints. If you've ever known a set of identical twins, you already know that they're not the same person. Twins may appear to be cut from the same cloth, but their genes reveal a different pattern and even they have unique personalities and slight differences that make them grow into different people over time. Likewise, a clone of a human being would share DNA but have very different experiences that could turn the clone into a very different person over time. Let's move on to read about cloning – and differences between therapeutic cloning, reproductive cloning and molecular/gene cloning and their respective applications. Cloning in biotechnology refers to processes used to create copies of DNA fragments (molecular cloning), cells (cell cloning), or organisms. Currently, there are two different ways to make an identical genetic copy of an organism in a lab: artificial embryo twinning and somatic cell nuclear transfer. 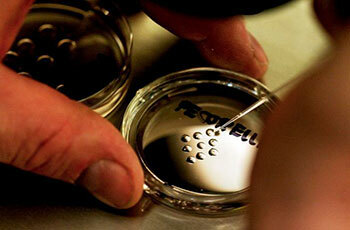 Artificial embryo twinning: It is a process of making clones that mimics the natural method of creating identical twins. This phenomenon is also known as embryo cloning or embryo splitting. Identical twins can form naturally when an early embryo splits and two fetuses grow from the two resulting embryos: artificial twinning occurs in the same way, but the embryo is split manually. 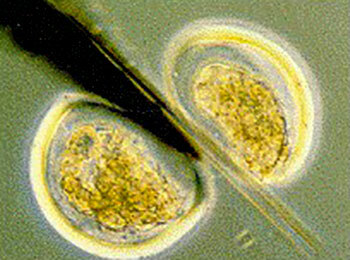 Artificial embryo twinning is a relatively low-tech way to make clones. As the name suggests, this technique mimics the natural process that creates identical twins. Naturally, twins form very early in development when the embryo splits in two. In the first days after egg and sperm join, when the embryo is made of just a small number of unspecialized cells – twinning happens. After that, each half of the embryo continues dividing on its own, finally developing into separate, complete individuals. Since they developed from the same fertilized egg, the resulting individuals are genetically identical. Artificial embryo twinning uses the same approach, but it is carried out in a in vitro conditions (Petri dish) instead of inside the mother (in vivo conditions). A very early embryo (The embryo is a clump of cells. After the embryo forms, the cells form the embryonic disk. The embryonic disk begins to fold, allowing the cells within the disk to touch other cells. The cells then start forming each of the bodily systems. For example, the organs and nervous system begin to develop at this stage. After approximately three weeks, each of the cells in the developing embryo is part of one of the developing systems in the body. After eight weeks, the embryo becomes a fetus.) is separated into individual cells, which are allowed to divide and develop for a short time in the Petri dish. The embryos are then placed into a surrogate mother, where they finish developing. Again, since all the embryos came from the same fertilized egg, they are genetically identical. In genetics and developmental biology, somatic cell nuclear transfer (SCNT) is a laboratory technique for creating an ovum with a donor nucleus. In SCNT the nucleus, which contains the organism's DNA, of a somatic cell (a body cell other than a sperm or egg cell) is removed and the rest of the cell discarded. This phenomenon is also called nuclear transfer, uses a different approach than artificial embryo twinning, but it produces the same result: an exact genetic copy, or clone, of an individual. This was the method used to create Dolly the Sheep. If we expand the term “Somatic cell nuclear transfer”; the definitions are as follows and if we combine all these, the process involved in SCNF is clear! Somatic cell: A somatic cell/vegetal cell (soma = body) is any cell in the body other than sperm and egg, the two types of reproductive cells/germ cells. If the process of germ cells is produced through meiosis, somatic cells are produced through the process of mitosis and cytokinesis. This continues to replace and generate old and damaged cells. If germ cells only contain one set of chromosomes, a somatic cell has a diploid number of chromosomes. Nuclear: The nucleus is a compartment that holds the cell's DNA. The DNA is divided into packages called chromosomes, and it contains all the information needed to form an organism and the small differences in our DNA that make each of us unique. 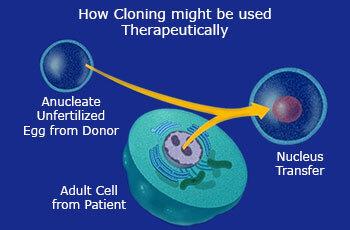 Thus, SCNT is a technique for cloning. The nucleus is removed from a healthy egg. This egg becomes the host for a nucleus that is transplanted from another cell, such as a skin cell. The resulting embryo can be used to generate embryonic stem cells with a genetic match to the nucleus donor (therapeutic cloning), or can be implanted into a surrogate mother to create a cloned individual, such as Dolly the sheep (reproductive cloning). The lamb, Dolly, was an exact genetic replica of the adult female sheep that donated the somatic cell. She was the first-ever mammal to be cloned from an adult somatic cell. Dividing ball of cells, called an embryo An embryo's cells have two complete sets of chromosomes in natural embryo and SCNT embryo. Difference between natural embryo and SCNT embryo! Natural fertilization (The fusion of the sperm (with 23 chromosomes) and the oocyte (with 23 chromosomes) at fertilization results in a live human being, a single-cell human zygote, with 46 chromosomes the number of chromosomes characteristic of an individual member of the human species. ), where egg and sperm join to produce an embryo, and SCNT both make the same thing: a dividing ball of cells, called an embryo. So what exactly is the difference between the two? An embryo's cells all have two complete sets of chromosomes. The difference between fertilization and SCNT lies in where those two sets come from. In fertilization, the sperm and egg have one set of chromosomes each. When the sperm and egg join, they grow into an embryo with two sets—one from the father's sperm and one from the mother's egg. In SCNT, the egg cell's single set of chromosomes is removed. It is replaced by the nucleus from a somatic cell, which already contains two complete sets of chromosomes. So, in the resulting embryo, both sets of chromosomes come from the somatic cell. Applications of SCNTSomatic cloning is emerging as a new biotechnology by which the opportunities arising from the advances in molecular genetics and genome analysis can be implemented in animal breeding to epigenetics. Somatic cloning is coming into existence as a new biotechnology by which the opportunities arising from the advances in molecular genetics and genome analysis can be implemented in animal breeding. Incredible and yet significant improvements have been made in SCNT protocols in the past years which now allow to embarking on practical applications. 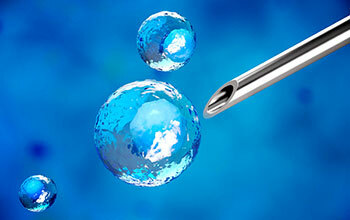 The main areas of application of SCNT are: Reproductive cloning, therapeutic cloning and basic research. 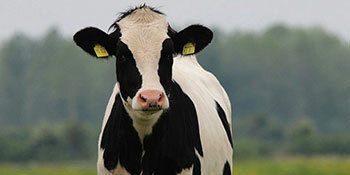 A great application potential of SCNT based cloning is the production of genetically modified (transgenic) animals. As somatic cells can be proliferated and gene-modified in vitro, this technique has been expected to contribute extensively to the farm animal production industry, drug production, regenerative medicine and conservation of invaluable genetic resources. Efficient transgenic animal production provides numerous opportunities for agriculture and biomedicine. Regulatory agencies around the world have agreed that food derived from cloned animals and their offspring is safe and there is no scientific basis for questioning this – [Source – ncbi]. Somatic cell nuclear transfer has become a focus of study in stem cell research. 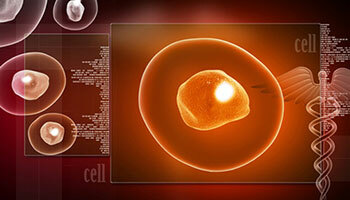 Embryonic stem cells are undifferentiated cells of an embryo. These cells are deemed to have a pluripotent potential because they have the ability to give rise to all of the tissues found in an adult organism. This ability allows stem cells to create any cell type, which could then be transplanted to replace damaged or destroyed cells. The aim of carrying out this procedure is to obtain pluripotent cells (Pluripotent, embryonic stem cells originate as inner mass cells within a blastocyst. These stem cells can become any tissue in the body, excluding a placenta. Only the morula's cells are totipotent, able to become all tissues and a placenta.) from a cloned embryo. These cells genetically match the donor organism from which they came. This gives them the ability to create patient specific pluripotent cells, which could then be used in therapies or disease research. A potential use of stem cells genetically matched to a patient would be to create cell lines that have genes linked to a patient's particular disease. By doing so, an in vitro model could be created, would be useful for studying that particular disease, potentially discovering its pathophysiology, and discovering therapies. For example, if a person with Parkinson’s disease donated his or her somatic cells, the stem cells resulting from SCNT would have genes that contribute to Parkinson's disease. The disease specific stem cell lines could then be studied in order to better understand the condition. 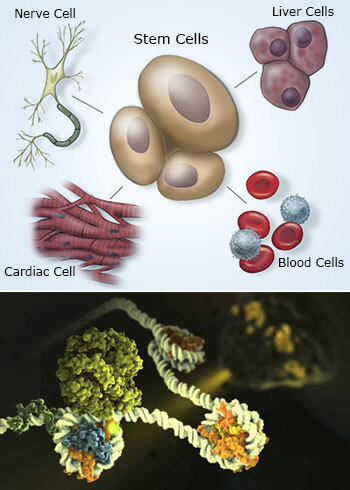 Besides its broad practical applications, SCNT can provide unique and interesting experimental systems for genomic research, especially in epigenetics (The behavior of a person's genes doesn't just depend on the genes' DNA sequence - it's also affected by so-called epigenetic factors. Changes in these factors can play a critical role in disease. ), to learn how the somatic cell genome is reprogrammed into a state equivalent to that of the fertilized oocyte: the so-called totipotent state. Cloning small part of you! In fact, we could say we can clone the smallest unit of you: one gene, we can apply it to any gene we want, although very long genes are tricky to clone. 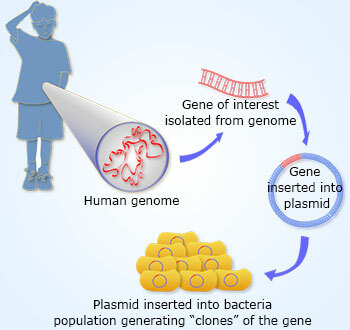 Is cloning an organism the same as cloning a gene? When molecular biologists use the term "cloning," they are usually referring to the process of cloning a gene, not an organism. If you want to clone yourself, start small by cloning a gene, it’s called as "Gene cloning". You might find something interesting. Thus from our experience of reading articles and newspapers it can be concluded that scientists with their incredible work can clone just about anything we want, from frogs to sheep—and probably even ourselves. So we can clone things for multitude of applications in various fields of science.